The holidays are quickly approaching, and there will be many travelers on the roads, many driving after a long day at work. Some will be driving after getting virtually no sleep. Our busy lives can make the roads a dangerous place, especially when so many are on the roads. Fatigue can be caused by many factors: a new baby keeping you awake at night, work, staying out late with friends, or a long, monotonous drive. Police and hospital reports are used by NHTSA to determine the number of drowsy-driving crashes. In 2015, police reported over 72,000 crashes involving drowsy drivers. These accidents caused 41,000 injuries and 824 deaths. A study by AAA Foundation for Traffic Safety examining data on 5,470 crashes, found that an estimated 7% of U.S. car accidents and 16% of all fatal collisions involve sleepy drivers. Research shows that those who get less than seven hours of sleep at night are not only more likely to be in a car accident, but to actually cause the crash. Although experts say adults need seven to nine hours of sleep at night, surveys show that 20% of Americans fall short of this recommendation. 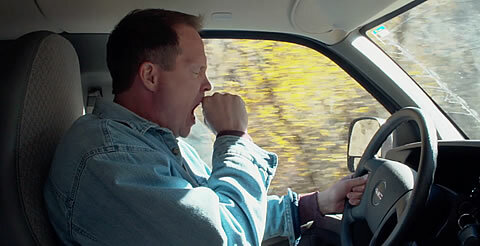 Getting seven to nine hours of sleep on a daily basis is the best way to avoid driving drowsy. For more information on healthy sleep, see the National Heart, Lung and Blood Institute website. Get a good night’s sleep before the start of a long family car trip. Advise teens to delay driving until they’re well-rested. Teens need more sleep than they realize. Avoid drinking alcohol before driving. Alcohol consumption increases sleepiness and impairment. Check prescriptions and over-the-counter labels on medicines you take to be sure drowsiness is not a side-effect. If so, use public transportation when possible. Avoid driving during peak sleepiness periods (midnight to 6:00AM and late afternoon). If you have suffered a collision in South Carolina, the legal team at the Law Offices of David L. Hood will help you navigate the situation professionally. We have years of experience in helping people involved in serious accidents figure out the legal requirements and details needed to move forward after an accident. After gathering all the necessary information we will pour our efforts into building your case to get a fair settlement or take it to court if the need arises. Our entire team has years of experience representing various clients and car accident victims in South Carolina. Having a passion to help, we offer a free initial consultation where we provide candid legal advice on what options you may have. If you choose to work with us, we promise a contingent-fee based case, where you don’t pay unless we get a recovery in your case. You can find our contact information on the page here and schedule your free consultation session. From that moment until your case is closed, we will stay with you each step of the way in the fight to achieve justice for you and your family.